Swimming Pool Patio Q&A: Will my concrete pool patio crack? Ben Franklin made the famous statement that the only things guaranteed in life are death and taxes. I've got news for you; good ole' Ben was wrong! Try this one: Death...taxes...and concrete will crack! That's not quite as catchy, but it's true nonetheless. So the straight answer to the question is: Yes your concrete pool deck will crack. But don't get excited, we're going to discuss why concrete cracks and then talk solutions. Let's see if we can comprehend this contrary characteristic of concrete. There are several types of cracks that occur in concrete. Among them are shrinkage cracks, structural cracks, freeze cracks, or cracks that occur from a "bad mix" of concrete, also known as product failure. Today we will focus on the one made popular by that famous episode of Seinfeld. Yep guys...that dang shrinkage strikes again! Seriously though, I want to look at shrinkage cracks because of the many types of cracks that occur in concrete, shrinkage cracks are the only ones not caused by human error, but a naturally occurring property of concrete. In other words, the only type guaranteed to happen to everyone. We'll talk about what causes shrinkage cracks and how to best manage them. We'll save the other types of cracks for another discussion; but for now, let's look at what causes shrinkage cracks in concrete. Basically what happens is this: Concrete is poured and placed in a fluid state. During and after finishing a chemical reaction occurs between the water and Portland cement which causes the concrete to harden. As the concrete hardens it cures and water is consumed in the reaction resulting in a loss of volume. This loss of volume causes the concrete to shrink at a rate of about one-sixteenth of an inch per ten feet. The concrete literally pulls itself apart as this occurs. So guess what happens to concrete every ten to twelve feet. You got it...a crack. These cracks typically occur shortly after pouring the concrete; anywhere from the same day to a few months down the road. When these cracks do occur, the crack does run through the entire thickness of the concrete slab and does typically run across the entire section of concrete. But this begs the question: What in the world can we do to manage these frustrating fissures? The solution is to do like Janet Jackson says and "control" the cracking of the concrete (remember that song...from the '80s...ok sorry). Control joints are the answer, or at least the best treatment. 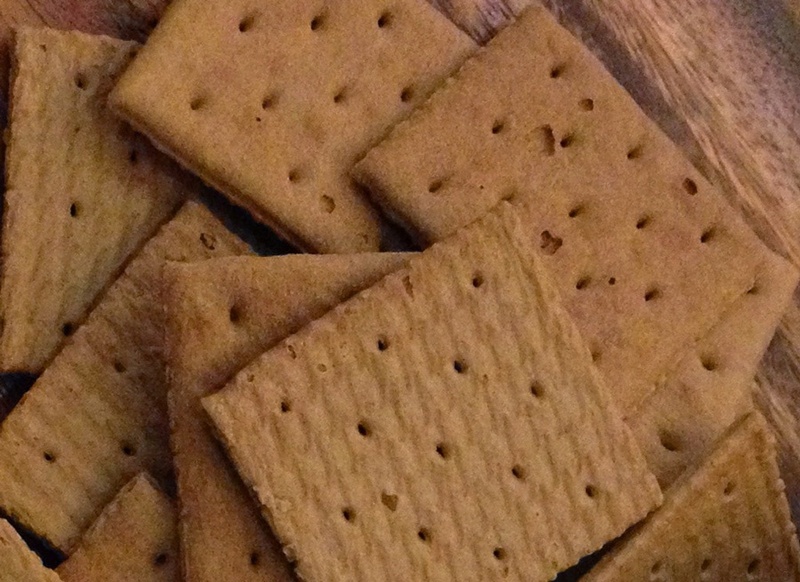 To better understand control joints let's look at the structure of a graham cracker. They come in big squares that are scored into sections to help you break it into smaller predictable pieces. Well, that's what we do with concrete. We score the concrete in strategic places to weaken the concrete and force the crack to occur within our pretty little line. These joints are installed by either cutting the concrete with a saw after it has set up or by "hand tooling" a joint while the concrete is being finished. Next time you see a concrete slab or sidewalk take a peek inside the control joints. You will see that the concrete has cracked down inside at least half of them. The problem that we've all had is that sometimes graham crackers don't break were we want them to. The same thing happens with concrete. Sometimes a crack will occur outside of a control joint. Fortunately these cases are in the minority, but there are methods that concrete finishers can employ to help the concrete the behave and crack where expected. Joint placement is critical, especially with pool patios. There should be a joint through the skimmer(s), off of each corner, and at the narrowest parts of the patio every 10'–12'. The depth of the control joints need to be at least ¼ of the thickness of the slab to be effective. The amount of water added to the concrete mix also plays a significant factor. Think about it: more water = more shrinkage. The "wetter" the concrete is, the easier it is for the finisher to place. That will make for an easier day for them but is bad news for you. We'll discuss the details of this at a later time, but for now just remember that too much water = unnecessary cracks. The reality is that there is no such thing as the perfect product. There are pros and cons to every patio material. This is the yin and yang of the construction world. Factors like maintenance, initial and lifetime cost, as well as inherent product flaws all need consideration in determining which patio material is best for you. Well, there you have it! Who would have thought that Ben Franklin, Jerry Seinfeld, and Janet Jackson could have taught us anything about concrete? What a crazy world we live in! Just because it will crack doesn't mean that you will see it. Your contractor can take measures to reduce and control shrinkage cracks in concrete. So until next time take care, enjoy those graham crackers, and don't forget to subscribe to our blog in the upper right hand corner of the page.